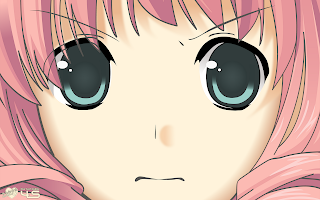 Katawa Shoujo Dev Blog: I might want to. Maybe. Would you like to be greeted by THIS every time you boot your computer? Yes, a wallpaper sized Misha vector, staring right at your soul. It's a bit huge, 2560*1600 but I don't care. Also here is a 4:3 version (1600*1200) for the non-widescreen folks.